We would like to welcome you with pleasure to our Hotel Leśny, located in a quiet and peaceful area of the city, near the Warsaw – Bialystok expressway. We provide a perfect place to rest while traveling, rooms guaranteeing comfort, with a subtle interior design. 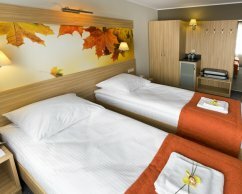 The Hotel Leśny is also an ideal place for a longer stay, being a convenient trip base to visit the area.